Enjoy a Free cup of fresh brewed Coffee. Any size, no purchase necessary. Click the link to go to Xtra Mart Facebook. Like them to get the coupon. 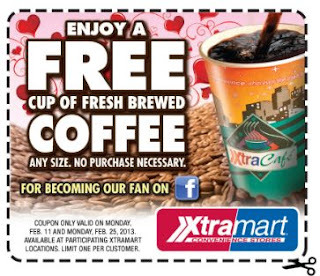 Print your coupon & take it to your local Xtra Mart to redeem. Exp. Feb 25, 2013.